The September and October Ghost Walks at the library were a huge success. As always, some Walks were quieter and some were amazing. One can never tell what you might find during one of the events. For anyone that does not know about our Ghost Walks, they are in fact a paranormal investigation. By purchasing a ticket you may join one of the tours you are allowed to partake. No one under the age of 15 is allowed to attend. Attendees are encouraged to bring their own ghost hunting equipment as well as use the libraries ghost hunting gadgets. These include KIIs, EMF detectors, digital recorders, camcorders, laser grid pens, and digital thermometers. Our hope is we or the patrons touring with us will be able to catch evidence of spirits in the building. After each event we ask anyone that is lucky enough to catch EVPs, photographs, or video to share with us. By recording this information and combining all evidence, a better view of what we have is known. Evidence is our key to help tell the story of the spirits in our midsts. 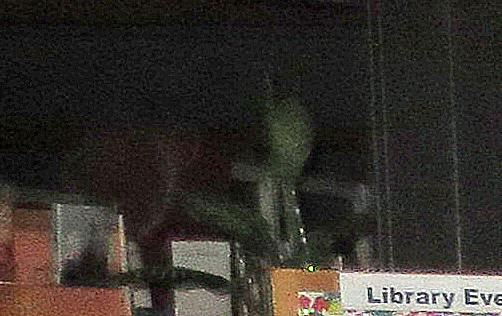 Not long after the last Ghost Walk tours, one of friends contacted me stating she might have caught a “green man” and would I review the photo and other evidence she emailed to me. I was excited but I know to always be a bit skeptical when it comes to evidence. Once I viewed the photo I did indeed see something green and it seemed to be hovering above where a regular person would be walking. I enlarged the photo but this was of no help. I then enlarged and printed the photo. This was also inconclusive. Next I physically walked and stood where the woman had stood while taking photographs. Debunked! I was disappointed to find what seemed to be the “green man” was actually a green plant. It seems a very tall thin plant stands just behind the Events Billboard. When the photo was taken light filtered through and made the large leaves seem to be transparent and they took on the shape of a possible human figure. As disappointing as it is at times to find the evidence debunked, we still press on. Once the woman was told she understood and was glad to know the truth one way or the other. I appreciate her understanding. I have in the past received photos of shadows and unknown shapes. The person that took them was not understanding when told of how the evidence had been debunked. It is never our intent to upset the person submitting proof, it is quite the opposite. We will now and forever continue to search for truth and hard facts whenever possible. Special thanks to Corrie Probst for sharing her photos and evidence. Thank you to all of those that have taken the time to share evidence proven or debunked. Your efforts are always appreciated. Our good friends PI Team of Utah (Paranormal Investigation Team of Utah) were good enough to be the guest speakers during the September 7th paranormal program. As always they provide our patrons with information and insight to world of spirits and the unknown. Later that night we granted PI Team of Utah access to the library for a paranormal investigation. This has not been their first visit. I believe this is their third investigation. After each visit they are gracious enough to provide us with a nicely laid-out report which provides us with addition information for the Ghost Log. Please view the following information from the official September 7, 2013 report. Members Present: Jenny, Joel, and Amy (shadow crew). Guest investigators Hannah, Ellie, Cheyenne and Jay-library staff & guest. History of the Location: The history of this location is well documented. Personal Experiences: For the most part, this investigation was quiet compared to prior investigations. We did not experience any unusual activity in the upstairs staff room, women’s restroom or side lobby of the library. During our investigation of the “Moose” area, we did experience some shuffling noises and what sounded like possible movement of books. Some experienced some EMF/KII hits but they were brief spikes; also used were a Ghost Box and Ovulus which yielded no remarkable results. However, in the garage area of the library, several people heard what sounded like something moving or falling in the back storage room but nothing seemed to be out of place. At the bottom of the steps leading into the garage, we were able to measure a significant KII spike that we believe to have a natural cause as it was consistent, pattern-istic and predictable in reading. However, Joel experienced some very compelling KII spikes while sitting on the steps in the garage that we were unable to debunk as having a natural cause. These spikes were higher and inconsistent, almost as if something came up and touched the device and then backed off. This happened three times when we asked for a sign that someone was there with us. Interestingly, the device did not react when either Jenny or Amy held it; it only reacted when Joel had it. In addition, Amy felt as if she were touched on the hip when we began investigating near the storage room at the back of the garage. Unexplained Equipment Malfunction/ Battery Drain: During this investigation, we did not have any equipment malfunctions; however one digital recorder turned off before it was full and the battery was fine. EMF Evidence: See personal experiences section above. Audio Evidence: During review, we were able to capture one true EVP which was collected in the “Moose” area. Amy and Jenny were investigating and heard what sounded like movement coming from the stacks. Jenny then placed some mag light flashlights on the table and asked for whatever was there to use them to communicate. The EVP captured is of what sounds like a man saying, “NO” and “Get out”. Conclusion: Although we had, for the most part, a quiet evening, we were not disappointed. The unexplained KII activity in the garage area was very interesting and calls for additional investigation of that particular area. The EVP that was captured is compelling. We look forward to an additional opportunity to try and see if we can get any specific names to associate with the male voice that was caught during our investigation. 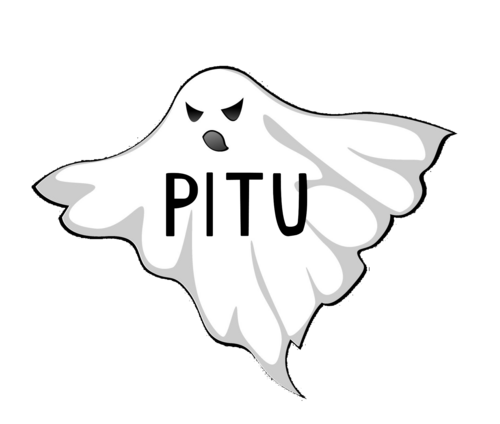 **I would like to send out a special thank you to PI Team of Utah for all they do and especially for sharing their report and EVPS.